Please read the entire description. 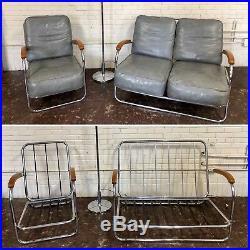 These are 2 amazing pieces of industrial designed furniture that look like they’re straight out of a time capsule. 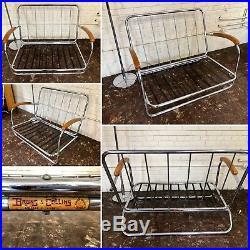 Streamlined chrome plated tubular steel frame with a double pole bottom frame, wood arm rests, and dense double bated cushions. These are very heavy, high quality and durable piece for furniture. See the 2nd to last photo for a peek inside the cushion construction – they do not make quality cushions like this anymore. All metal construction with exposed metal parts in Royalchrome quality plating. Cushions covered in Super-Tuftex leatherette which is a coated vinyl plastic that is fire resistant and will not crack, peel or bubble under normal use (quoted information was taken from an original Royalchrome paper advertisement). This chair does not have a label. The 2 seater sofa has a label that says “Bruns & Collins Chicago 5 Illinois”. All I know is that they were a wholesale distributor. 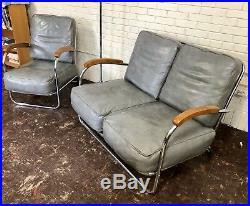 Based on my research and the other furniture from the lot this came from I believe these pieces are Royalchrome manufactured by Royal Metal Manufacturing and possibly designed by Kem Weber or Wolfgang Hoffmann Circa 1930′s-1950′s. This style has been referred to as Art Deco, American Streamline, Machine Age, Industrial, and Mid Century Modern. This chair and sofa are very comfortable, the armrests sit at a great height for comfortable lounging. 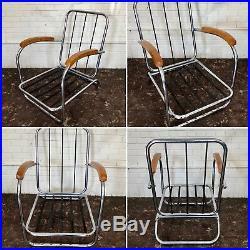 These would be amazing vintage additions to anyone’s home, library or office and no doubt great talking pieces. Both pieces have been stored in a room that has been unused for the past 20+ years at a local church. 50% of the proceeds from this sale will go back to the church to benefit the local community. 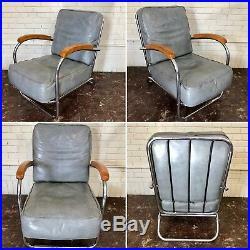 I have more art deco furniture listed and have more I will be listing soon. Both chrome frames are in very good condition, have been cleaned and shined up, some minor scratches. The wood is also in good condition, there are some markings and scratches. The cushions are all original. They have been cleaned up, possibly they could be further cleaned. They have some discoloration and denting. 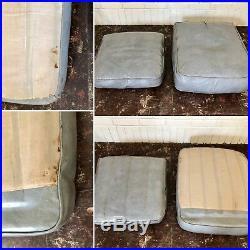 The underside of both cushions for the chair have some staining on the underside and one has a very small tear. I did not photograph the underside of the sofa cushions. All of the cushions are still very firm. The sofa/settee has 2 replacement screws on the lower frame. Please view all photos and zoom in as they are part of the condition description. Frame seat: 24.5″D x 21″W, front bar sits 8 off ground. Frame back: 27″T x 21″W x bar sits 6 off ground. Outer armrest to armrest: 24. Total depth for packing 32. Bottom cushion: 25.5″D x 20.5″W x 6.5T. Top/back cushion: 21″D x 21″W x 4.5T. 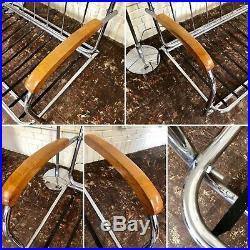 Seat frame: 42″W x 25″D x front frame rests 7.5 off floor. Outer armrest to armrest: 45W. Back frame: 42″W x 27.5″H. Total frame: 32″H x 36″D. Armrest height: 24H. Seat: 25.5″D x 21″W x 7H. Back: 20.5″D x 20.5″W x 4H. The above information is based on my observations and research. Please determine the manufacturing and designer based on your own assessment. Let me know if you have any questions! 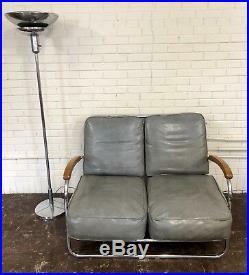 The item “Vtg Art Deco Machine Age Royal Metal Gray/Blue Vinyl Chrome Chair & Sofa/Settee” is in sale since Thursday, January 31, 2019. This item is in the category “Antiques\Periods & Styles\Art Deco”. 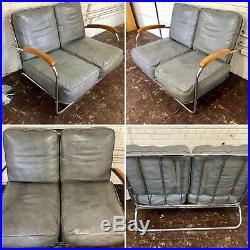 The seller is “vinefindsvintage” and is located in Lemont, Illinois. This item can be shipped to United States.